MORE THAN 100 young school children celebrated a graduation yesterday to mark the completion of an innovative literacy programme. The five- and six-year-olds from Tallaght West celebrated the improved literacy skills they gained from an intensive early-years intervention programme over the past nine months. 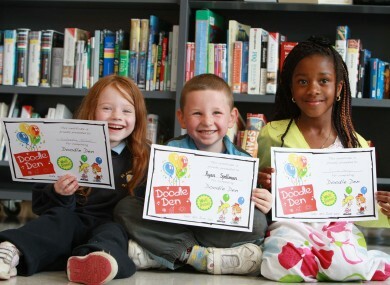 Since last September, the 105 Senior Infants pupils participated in three after-school sessions per week as part of the Doodle Den programme which was developed by the Childhood Development Initiative (CDI) to help improve reading, writing and comprehension. During the sessions, they took part in fun activities to help learn new sounds and words. The parents of the students from Killinarden, Fettercairn, Jobstown and Brookfield in Tallaght West also attended six of the lessons to enable them to continue the children’s learning in the home. There was also one organised family activity per term, including a to the local library or a story-telling session. Doodle Den is part of a major early-years research and evaluation project taking place across Tallaght West, Ballymun and Darndale. Chief executive officer Marian Quinn said the effectiveness of the programme is being “carefully measured” by the CDI. So far, it has been identified as something of “real benefit to the children and their families”. “We will be bringing what we have learnt to the attention of the Department of Children and the Department of Education and hope more children can benefit from early intervention supports,” she added. Email “Tallaght children graduate with improved literacy skills”. Feedback on “Tallaght children graduate with improved literacy skills”.